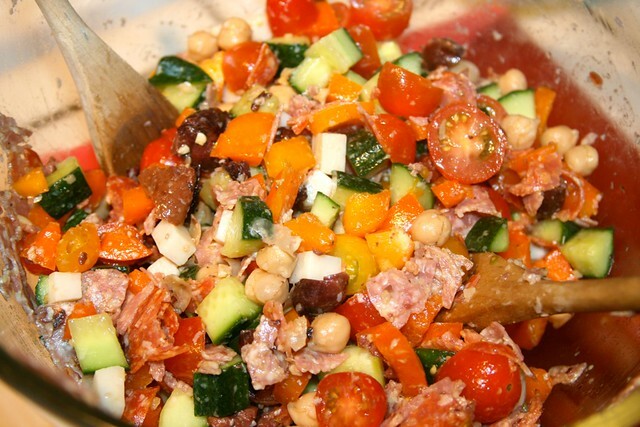 One of my favorite summertime salads is an Italian chopped salad. We enjoy this at least once a week in the summer. It's easy to make, very good for you, and bursting with the flavors of summer produce. And you don't have to heat up the kitchen. If you don't have all of the ingredients on hand, you can make it anyway. Just add or subtract as necessary. That's the beauty of a chopped salad — it's a great way to use up leftovers. 1. Make the dressing: In a small bowl, or large Pyrex measuring cup, add 3 TBS of vinegar. 2. Whisk in 6 TBS olive oil. 3. Mince the garlic and add that to the bowl. 4. Whisk in sea salt and black pepper to taste. Set aside. 5. Rinse and dry the salad greens and tear into bite size pieces. Place in a large salad bowl. 6. Cut off the stalks from the optional fennel bulb and discard. Slice the bulb as thinly as possible. Place in the bowl. 7. Wash and dry the optional parsley and coarsely chop a few TBS worth, add to the bowl. 8. Chop up the red bell pepper and the cucumber, discarding the seeds. Add to bowl. 9. Chop up the tomatoes and add to the bowl. 10. Drain the optional artichoke hearts and slice each heart in half. Add to bowl. 11. Slice the salami and the leftover chicken or turkey into 1/2-inch thick slices, and cut into 2-inch long matchsticks. Add to bowl. 12. Drain Kalamata olives, cut in half and remove pits. Add to bowl. 13. Crumble the asiago cheese. Sprinkle cheese on salad. 14. When ready to serve, toss with salad dressing (a little at a time) and sea salt and pepper to taste. Looks delicious. So bright and colorful. Do you have recommendations on where to get the salami/pepperoni? Applegate brand has some wonderful luncheon type meats. Yum!!! This looks very delicious!!!! my thoughts exactly. this looks so yummy. This could be made without the meats (for my husband, I’m an omnivore! ), and still be quite delicious. I’m tellin’ ya though, salami is in the air. I’ve been craving it for a week. Did you know that salami triggers the same sort of endorphin rush that chocolates do? Yep, it does. Heard about it on NPR about, oh, ten years ago. Did you add garbanzo beans to the batch pictured?